...kind of. I'm in Chicago this week, staying at Hotel Sax (formerly the House of Blues). My colleagues and I returned from dinner tonight (Sunday) for a few cocktails when a couple dozen NBA players took over the hotel bar. Turns out it's Antoine Walker's birthday and his best buds came out to celebrate(including NBA players and "Last Comic Standing" finalist Lavell Crawford). I have to admit, I didn't recognize Mr. Walker but knew of him because he was recently held at gunpoint and his home robbed. We sat in our corner trying to figure out who the celebs were and asked for the obligatory photo ops. Everyone was soooo nice and friendly and we were even included in Mr. Walker's champagne toast in which a handful of friends made bid the Miami Heat player best wishes. The crowd later boarded a bus to go clubbing, we opted to hang out in the bar and absorb what we just saw (not that we had a choice). 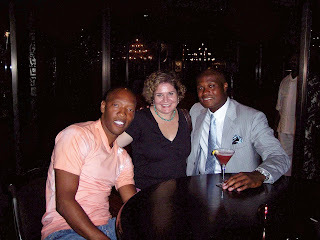 Top photo: Sam Cassell (a Florida State fella - Go Noles! ), Me and Antoine Walker. 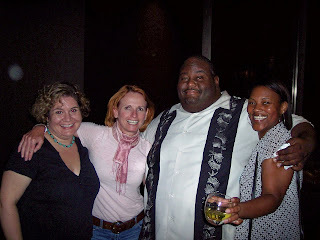 Bottom photo: Me, TV (my boss), Lavell Crawford and Friendly Woman. Cool, I love that stuff. And NBA folks are so big. I saw Magic Johnson at an event last week. He was HUGE! You go, Girl! Will look for the photos.